​independent, custom vacation, taking in Australia's most famous landmarks, rainforest, and wildlife! DAY ONE - WELCOME TO SYDNEY! Stylish Sydney…Australia’s largest city is filled with vibrant life, character and a sense of daring. The multiculturalism means a wealth of amazing dining experiences. You’ll stay 3 nights in a 3-star downtown hotel, located within easy walking distance of all major tourist attractions, shopping, and restaurants. This afternoon cruise to spectacular Middle Harbor is a must for all visitors to Sydney. 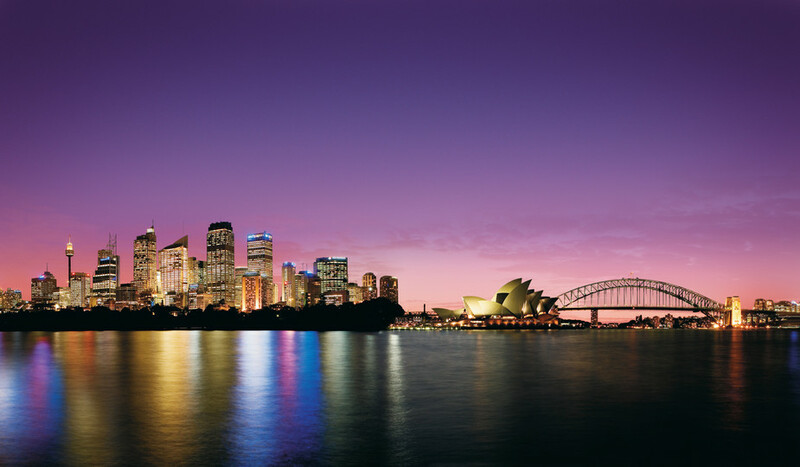 This world renowned cruise to the upper reaches of Sydney Harbor, featuring magnificent waterfront homes and parklands, gives a comprehensive view of what Sydney is all about, and is a favorite with our international visitors. This morning take a guided tour capturing the history of Sydney, stunning architecture, spectacular harbor views and the world famous Bondi Beach. Pass through the historical Rocks area and Circular QuayTravel through Chinatown, Darling Harbor, Kings Cross and Double Bay. Enjoy morning tea at the world famous Bondi Beach (own expense). This afternoon see inside the world's most recognizable sails, the Sydney Opera House. Experience this miracle of architecture and engineering. A work of art that has become one of the busiest performing arts centers in the world. Visit the award-winning Featherdale Wildlife Park - pat a cuddly koala. See amazing Australian animals including koalas, kangaroos, crocodiles. Enjoy fantastic photo opportunities and the chance to feed and interact with the animals! See the historic township of Katoomba. Take in the spectacular scenery of Jamison and Megalong Valley. Take a ride on the world's steepest railway (own expense). See the Three Sisters rock formation. After descending the mountains take a Rivercat along the Parramatta River arriving in Sydney late afternoon at Circular Quay. Fly Sydney To Ayers Rock. WELCOME TO THE RED CENTER! This evening dine under a million stars at the award-winning Sounds of Silence Dinner. Enjoy a gourmet buffet of Australian delicacies accompanied by fine Australian wines, then sit back and relax as an astronomer takes you on a tour of the night skies (conditions permitting). Rise early to watch the first rays of the sun set the Red Centre and Uluru alight. After sunrise join your Driver Guide for a tour around the base of Uluru then travel to the Mutitjulu Waterhole. Here view Aboriginal rock art and learn about the area as your Driver Guide indicates native flora and fauna and explains the history of Uluru. Visit the Uluru – Kata Tjuta Cultural Centre to see locally-made arts and crafts. This afternoon travel to the mystical 36 domes of Kata Tjuta (the Olgas) stopping en route for panoramic views of its southern side. Continue to Walpa Gorge where the walking trail through the gorge follows the natural creek bed between two of the tallest domes of Kata Tjuta. Enjoy nibbles and a complimentary glass of wine while watching striking color changes of Uluru at sunset. There is time for an optional scenic helicopter flight or a Harley Davidson ride around Uluru (additional expense). Later you will be transferred from your hotel to Ayers Rock Airport for your flight. Fly Ayers Rock to Cairns. Cairns is the heart of Tropical North Queensland and is the primary gateway to Northern Australia & the Great Barrier Reef. Today you’ll journey to a reef at the very edge of Australia's Continental Shelf, to an underwater world that is a dazzling kaleidoscope of color and brilliance. Experience firsthand the magic that is the Great Barrier Reef. You can choose to dive, snorkel, or stay dry and explore the stunning reef from the comfort of a semi-sub or from a unique underwater observatory. Includes morning and afternoon tea, Reef presentation by marine biologist, hot and cold tropical smorgasbord lunch and all snorkeling equipment. Your day begins with a historical rail journey to Kuranda. Enjoy breathtaking views enroute, including the cane fields of Cairns to the tropical rainforest of Kuranda. 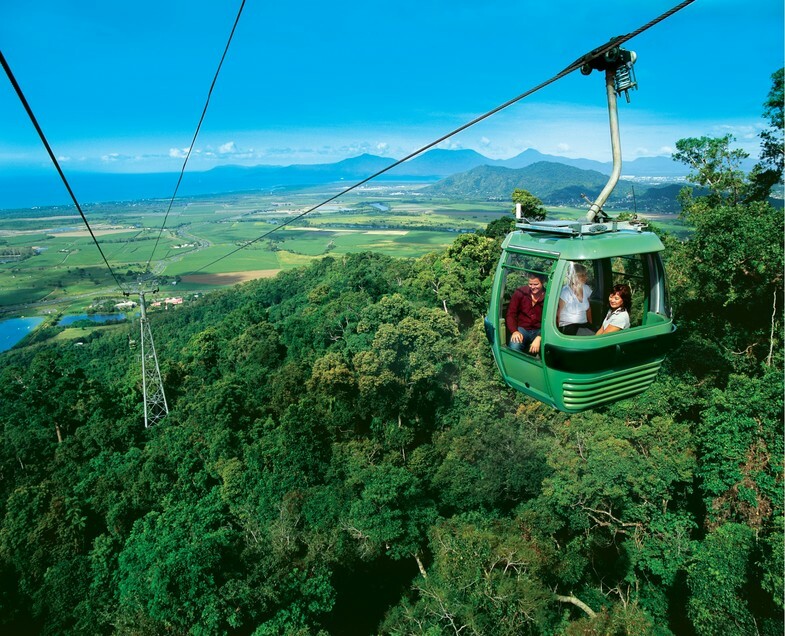 Upon arrival in Kuranda, there is limited free time before boarding Skyrail. Relax & enjoy the world's most beautiful rainforest gondola experience, stopping to explore the two stations, boardwalks & the CSIRO Interpretive Centre. Our coach will collect you & transfer you to Hartley's Crocodile Adventures - the best place to see crocodiles in Tropical North Queensland. Explore the rest of the park with its abundance of wildlife, including water birds, turtles, wallabies and cassowaries. See the notorious head shake and death roll of a huge crocodile at the Crocodile Attack Show. Discover the world's most venomous snakes at the Snake Show before the return transfer to your accommodation.